Kids are finally back in school and normality is settling in. 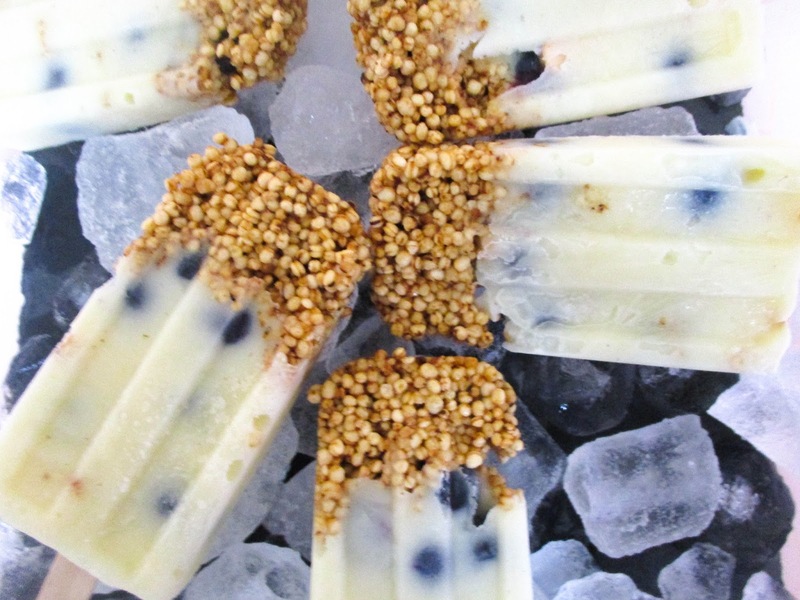 Getting back into your morning routine can be a tad difficult, but with a little helping hand with these 'Frozen Yogurt Breakfast Pops' they can help kickstart your day. I never really been a brekkie person, but now it is not just me that I have to feed, breakfast is a must! After all its the best way to fuel you and your families day. Still being quite humid out and tubes are back to being horrendously hot and sticky, you and your little sprogs can cool off with this super quick Frozen Yoghurt breakfast pop all before boarding the delightful public transport. What is great about the breakfast pop is, that it is a brilliant way to get your kids to try out different fruits that they would normally not want to try. So after carefully planning and sneaking in some blueberries using my mothering powers of distraction (Mickey Mouse Clubhouse) my little Cha-Chi was lapping up this frozen yoghurt breakfast pop on route to nursery (once it has set of course), she can not get enough of blueberries and is now a firm household favourite, so everyone is a winner. Only 4 ingredients needed, not much work on your behalf to prep and all items can be bought in any supermarket close to home, you can whip up these bad boys up on a Sunday night ready in time for the working week. 1. 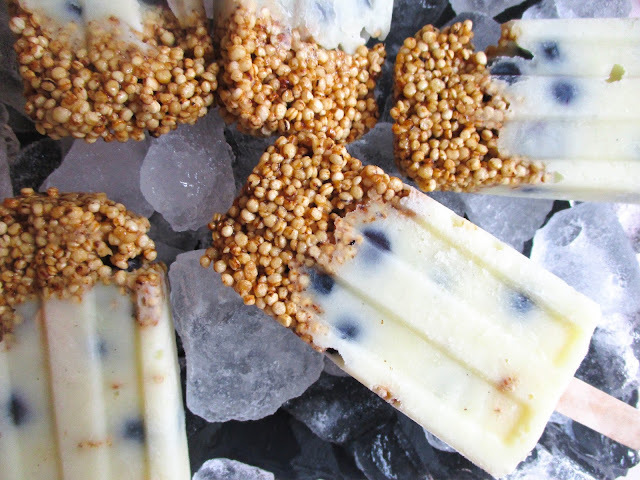 Mix your maple syrup and quinoa pops together in a mixing bowl and soon into your ice cream old, pushing down so it is nice and compact at the bottom. 2. Place 2 - 3 blueberries on top of the quinoa pops, then pour over some of your yoghurts, then a few more blueberries, repeat until the mould is half a centimetre full. Insert your lolly sticks, place in the fridge to set overnight, or if you can't wait at least leave it for 5 hours. 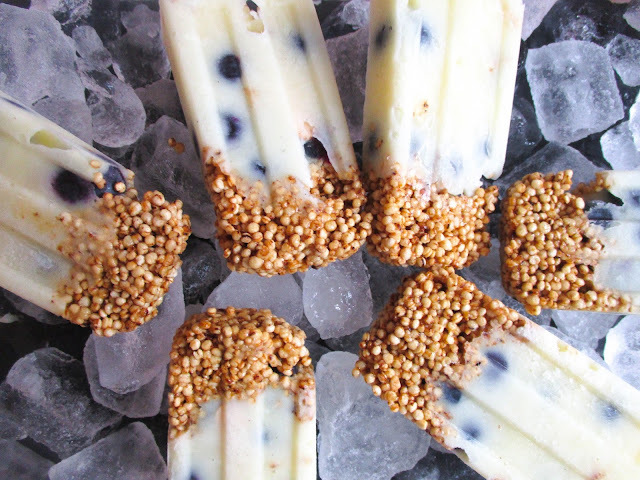 Let me know what you think of these Frozen Breakfast Pops. If you decide on making these, tag us in your picture on Instagram @lindseylondonmumma and you can find more recipes on our Bloglovin and Facebook page too.